J. F. Rogers is a Christian Fantasy author. Her Ariboslia series demonstrates the Christian struggle: first in coming to know God, then trusting Him, then obeying even when you don’t understand. A mysterious amulet leads Fallon to everything she’s ever wanted…and possibly her death. After a lifetime with no knowledge of her parents, troubled seventeen-year-old Fallon Webb receives a necklace once belonging to her mother. The amulet leads her on a life-changing journey through a portal to a foreign land where she encounters unusual creatures, shape-shifters, and something she’s always longed for—family. In Ariboslia, Fallon learns her mother is alive. Vampire-like creatures have her, and many others, captive. Most distressing is the prophecy that devastated her family. Can she trust it? Because if it’s right, Fallon must destroy the vampires’ leader—her uncle—to rescue her mother and free her people from the threat. Unprepared and afraid, Fallon sets out on the journey, with no skills to assist her quest and no other way home. In her travels, she learns about the One True God and how desperately she needs Him. Perhaps, with His help, she’ll find a way to fulfill her destiny and stay alive. Astray is the first book in the Ariboslia Christian fantasy series. 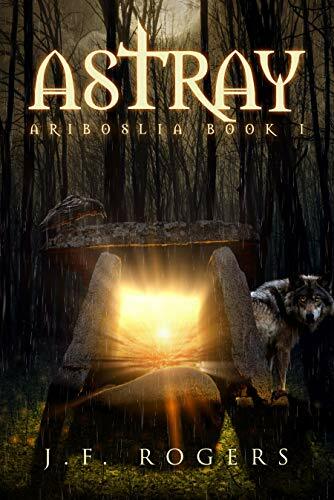 If you enjoy visiting alternate worlds that feature fast-paced adventure, supernatural creatures, compelling characters, and exciting plot twists, come to Ariboslia. You’ll love this first installment in J. F. Rogers’ page-turning series. Get it Free Today at your favorite book retailer! “This is the author’s debut novel, and she’s off to a good start. The story is well laid out with a plot that never drags. This was such a different take on good VS evil than I expected so bravo for that. I really liked this book! The characters are interesting and realistic, the plot kept my attention and even surprised me in parts, and the book was well-written and enjoyable to read. F. Rogers lives in southern Maine with her husband and daughter. She has a degree in Behavioral Science and teaches a fifth- and sixth-grade Sunday school class. When she’s not visiting Ariboslia, you can find her buried in snow or kayaking, depending on the time of year. Or at church. She’s a junk-food junkie turned health nut who believes wholeheartedly in the One True God and can say with certainty—you are loved. Now that Shards of Faith is done and published (yay!) I can get down to some series spring cleaning while I gather ideas together for the next book. What does that mean exactly? Well, for starters I am re-editing Journey to Aviad, because it has needed that for a long time. In working on that project, I can really see how much Elowyn has grown, and how I’ve grown with her. You can read more about that in my most recent newsletter, which incidentally is a great place to find lots of free books. So if you’re not subscribed yet, check it out. Series spring cleaning doesn’t stop there. Did you know I’ve already created a large timeline that details all the major events in my world’s history, starting right from the Creation story? Now I need a new one that contains all the more current events in my books, from the new novella (which takes place in the past), all the way through Visions of Light and Shadow. Instead of showing events by the year, it will zoom much closer in to view things down to the hour, or even minute if I want it to. I’m using a program called AEON Timeline, and it’s the best way for me to keep the details straight, because at this point there’s an awful lot of information for me to just remember in my head! Once this monumental task is done, I’ll be able to see how old each character is and where they are located at any given point. I will be able to identify and group story arcs, and visually see where subplots overlap and connect with each other. As you can see from the image above, I’ve started this new timeline already, but completing it is going to take a while. It will be so worth it though! It’s already fun to see how things intertwine, particularly with Journey to Aviad and Into the Shadow Wood, which take place in the same time period. While I’m doing this, I’ll also be taking LOTS of notes–looking for plot threads I’ve started but not tied off yet, and getting ideas together for new short stories, novellas, and of course series books. All of this is gearing me up for another Camp NaNoWriMo session in April. As you can see, a writer’s work is never done. I’ve got even more on my plate now than I did while I was working on Shards of Faith. I do have to take breaks every now and then so my head doesn’t explode. When I can’t stare at my computer screen anymore, I’m getting a bit of quilting done. But I’ll save that for another post. I’m nearly there, everyone! My most recently written chapters are now in the hands of my book coach for review, and the very–last–chapter has been started. *Whew! * I can see the finish line now, and that’s a great feeling. To help me get through these last few thousand words, I’ve got a great behind-the-scenes team cheering me on. First, the peanut gallery–courtesy of my youngest daughter. They mainly offer ideas, and sometimes point out typos and other little mistakes I’ve made as I’m writing. I can only handle them in small doses though. Like most birds…well, how to say this delicately…they simply talk too much. I know a lot of writers enjoy background noise and even music while they write, but for me to immerse myself in a totally different world, I need to be able to tune out this one. Peace and quiet while I sit at my desk helps my imagination flow. Then there’s tech support for all those pesky Windows updates that insist on pushing through whether I want them or not. Usually as soon as I walk away from my computer, too. I’m always afraid I’m going to lose whatever I’ve been writing when that happens. So far I’ve been lucky! The problem with losing a piece of writing is, no matter how good your memory, you’ll never re-create it exactly the same way twice. Cera is 18, so she’s got a lot of experience at walking across keyboards. Somehow she knows how to make my computer do things I never even realized were possible. Finally there’s my moral support team…a few of them anyway. Yeah, that’s me somewhere under that pile of animals. Their job is to keep me wedged into my seat so that I can’t wander off and get distracted by other things. It’s so much easier to just keep writing. I’ve learned to be ready to grab my laptop at any moment though to keep it from crashing to the floor. A ringing doorbell means the world is quite possibly coming to an end, and it’s their job to warn the whole neighborhood about it. They take the job pretty seriously! I’ve been working diligently on my next novella which features Broguean the Bard, and for those of you who have been waiting so patiently, I’m happy to announce that the wait is almost over! I am down to the very end now, having just written the climax of the book, and I’m on track to finish up within the next couple of weeks. Then I’ll be on to the business of looking for a few beta readers, editing, and polishing everything up for publication. As you can see, the artwork is finished, provided once again by the very talented Alfredo Pachicano! All I need now is a title so that it can be turned from a single image into an actual book cover. If all goes according to plan, this novella will hit ebook shelves sometime in March. Stay tuned for more specifics as they become available. Interested in being considered as a beta reader for this and future books? In an upcoming newsletter I’ll be asking for volunteers who are already familiar with my series. Subscribers also get the chance to win prizes and gain inside information about my world, characters, and inspirations that can’t be found anywhere else. When you sign up, you’ll get a free copy of my second book, Ancient Voices: Into the Depths.